These downloadable PDFs include a number of documents that may be useful when making sense of the specimens discovered during your BioBlitz. 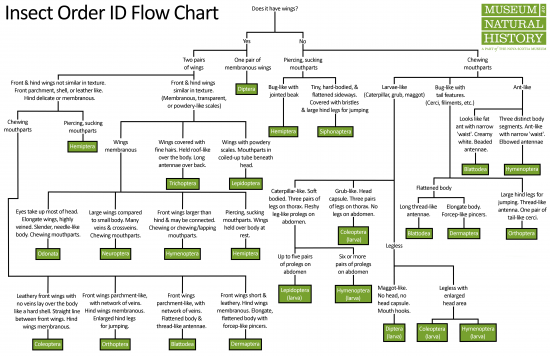 The Insect ID Flowchart will help your students get to the taxonomic level of order for identification. The antennae & mouthparts, along with the Insect Characteristics, will be helpful if you try IDing to family or have conversations about important characteristics for invertebrate identification. The tracks sheet will be helpful in deciphering some of the signs that animals might have left behind. These links offer some useful keys for identification of a variety of arthropods. Identifying down to family is usually adequate for recording results in a BioBlitz, but continuing down to genus and species can be a fun challenge for older students. These additional resources are good for validating identifications of specimens, learning more about biodiversity, and as general research tools for animals, plants, & habitats.